Hypoproteinemia in sepsis – low plasma colloid osmotic pressure is less able to facilitate oncotic reabsorption. As patients become more hypovolemic, pulse pressure variability increases. 6. In the event of persistent hypotension after initial fluid administration (MAP < 65 mm Hg) or if initial lactate was ≥4 mmol/L, re-assess volume status and tissue perfusion. 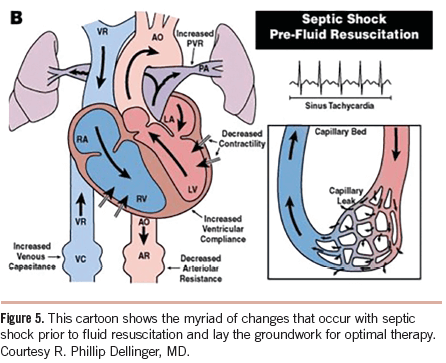 Vasopressors may be started from peripheral line but central line must be established as soon as possible. Start with a dose rate of 0.1 microgram/kg/min and titrate upward as needed. Dose rates up to 3.3 microgram/kg/min are successful in raising the blood pressure in most cases. If the desired MAP is not achieved at a dose rate of 3–3.5 microgram/kg/min, add a second vasopressor. Norepinephrine is favored by many because it is more likely to raise the blood pressure than dopamine, and is less likely to promote arrhythmias. 3Marino P. Marino’s the ICU book. 4th ed. Wolters Kluwer Health; 2014. 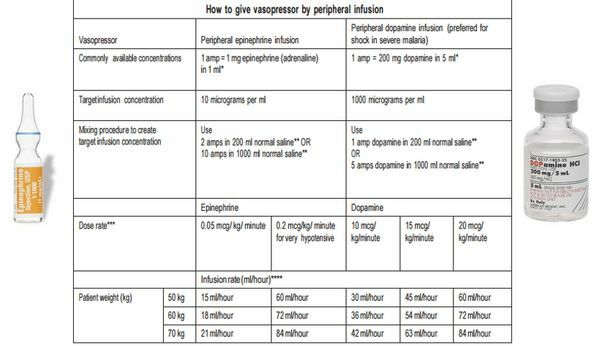 Vasopressin 0.03 units/minute can be added to NE to raise MAP or decrease NE dosage. Vasopressin is a pure vasoconstrictor that can promote splanchnic and digital ischemia, especially at high dose rates. Start at a dose rate of 5 microgram/kg/min and titrate up-ward as needed. Vasoconstriction is the predominant effect at dose rates above 10 microgram/kg/min. If the desired MAP is not achieved with a dose rate of 20 ∝g/kg/min, add NE as a second vasopressor. Reno-protective low dopamine dosing is a myth. Fresh frozen plasma to be used only in cases of active bleeding or planned invasive procedure in the setting of deranged clotting profiles. Previous Previous post: Is there no role of Early Goal Directed Therapy (EGDT) in Sepsis and Septic shock?